We take for granted that products on the store shelves are, not only good for us, but safe as well. Little do we realize that industries involved in things like supplements and personal care products are largely unregulated. To take it even further… many companies are allowed to use ingredients that are known to be toxic to the human body (several of them banned in other countries outside the U.S.). Yet, here we are brushing, rubbing, shampooing, and soaking ourselves in chemical soups each day, blind-as-a-bat to the hazardous effects (and keep these products out of your eyes or it might not just be a figure of speech). The issue is so grand, but I wanted to put a nice PSA together to talk about a few of the most pervasive and problematic chemicals in popular personal care products. Take good notes, and take action on what you see fit. And definitely share this one with the people you care about. Enjoy! The surprising percentage of compounds that can enter your body through your skin. Interesting everyday things that your skin absorbs. One of the few natural supplements that’s PROVEN to increase physical strength and endurance. The #1 thing you want to avoid in conventional deodorants. Why it’s more important to lower your overall toxic load (and not eliminate every imperfect personal care product you have). Which chemical (found in lotions, shampoo, and many other products) has been found to concentrate itself in human breast tissue. The potentially harmful compound used to give shampoos and detergents it’s liquid consistency. How many “anti-aging” creams ironically accelerate the aging of your skin. What overlooked activity your cell membranes are responsible for. The shocking truth about baby oil. How labeling ingredients as “Fragrance” on products gives manufacturers a dangerous free pass. What impacts chemical dyes may be having on your health. How to find amazing personal care products that are free of The Sinister 6! This is a topic I've been wanting to talk about for a very long time, and I wanted to go through and get more experience, and get more clinical evidence as to just how importance this is. You know, we make the transition to start to kind of transform our bodies and our health, we tend to go right to food first, which is a great first step. But from there, there's this kind of natural transition that happens for people who become aware of just how much food matters. You start to realize, 'Wait a minute, it's not just eliminating these toxic foods, it's also eliminating these toxic personal care products.' Right? And this is because what we put into our skin intrinsically ends up in our bodies. Literally upwards of 60% of the things you put on your skin ends up in your circulation. So what you put on your body, the personal care products that you choose matters a whole lot. So that's what we're going to focus in on today. What are some of the things we need to be mindful of? And what are some of the options that we actually have today? Now I want to preface this by saying I want you to start looking at these things differently. I want you to start looking at the things that you put onto your body, your personal care products, start to look at them as food because oftentimes this is kind of like another way that your body is getting fed. It's absorbing these things. And your skin is literally your largest organ. It's your body's largest organ, and it's an important organ in detoxification, but also absorption, alright? We've got hormone creams on the market. Why in the world would you rub a hormone cream into your skin? It's because it gets absorbed that way. Alright? Epsom salt baths, right? People have been talking about this for centuries. Your body will absorb that magnesium and help to reduce symptoms of stress, and muscle tension, and all that stuff. It's another thing that we absorb. We absorb light. You know, your skin- you have photoreceptors in your skin that pick up light. The things you put on your skin can actually influence how your body is relating to the light you're exposed to as well. So I want you to start to not just look at your food labels, but the way that you're looking at your food labels, I want you to start looking at your personal care product labels the same way with as much scrutiny. free and total access to use almost any ingredient or raw material without government approval. Alright? Without government approval. So few of us actually realize this. This industry is largely unregulated and essentially there's no pre-approval for products before they hit the market, and before they hit your shopping cart, and before they hit your skin. Alright? So I want you to have that as a preface to this episode, and we're going to dive in and look at some of the things, again to be aware of, and some of the great options that we have today. But before we get to the show topic, I want to give a quick shout-out to our show sponsor, my family, www.Onnit.com. Head over to www.Onnit.com/model and you get 10% off all of their health and human performance supplements, their fitness gear, their fitness equipment. They've got so much cool stuff, and this is why I love them. You've got to really get this. They actually fund clinical studies on their products. Do you know how few and far between it is to find a company that's willing to put their money up and actually get clinical trials done on their products to prove the things that they're saying are actually happening? Now let me give you an example. Their Shroom Tech Sport, this is their pre-workout supplement that I absolutely love. Clinical trial they funded at Florida State University, and here's what they discovered. Utilizing- and this was using the Shroom Tech Sport versus a placebo, they found that utilizing Shroom Tech Sport was shown to increase bench press reps by 12%. How much you bench, bro? Alright, you can get it up here with Shroom Tech Sport. It was shown to increase bench press and back squat reps by 7%, and it was also shown to increase cardiovascular performance by 8.8%. Now these numbers might sound small, but they are tremendous in the grand scheme of things because just a few percent makes all the difference in our performance whether we win or lose, and also that extra ability to push past, to go that extra level, that extra inch, that extra bit of weight to really get those changes that we want with our bodies, alright? This is incredible supportive of that, and the hallmark part of the formula is cordyceps mushroom, and I'm a huge fan of cordyceps, as you probably already know. This is clinically proven to increase insulin sensitivity of your cells, insulin resistance. A classic sign of that is carrying around more belly fat. Alright so this is helping to do the opposite, and also clinically proven to improve or enhance the oxygenation of your cells, how your body is processing oxygen. And that really boils down to performance. It's how your body is utilizing oxygen, and this is why the formula- again, clinical trial done proven to do so. Also features ashwagandha, green tea extract which has some really interesting properties with fat loss if you look at the EGCG compound in there. And also Methyl B-12. This is the methylated form of B-12 that your body can actually use. And B-12 is really something that has a lot to do with energy production in your body. Alright so this is just one of their incredible products. Head over, check them out. It's www.Onnit.com/model for 10% off everything. Alright? And now on that note, let's get to the iTunes review of the week. ITunes Review: Another five star review titled 'Mindset Blown,' by MiBoCa. 'As someone who will always struggle with weight, Shawn's podcast is exactly what I needed to change my mindset and love myself just as I am. I've shifted my focus on being proud of making healthy decisions, not the number on the scale. Simple things I've learned from Shawn have positively impacted my life in significant ways, specifically the morning routine I have set for myself ensures (which includes drinking a green juice and listening to the pod) that I start each day with a calm mind, nourished body, and positive attitude. Shawn Stevenson: Wow, wow, wow. Thank you so much for sharing that. That is so powerful, and what a way to kick off your day, feeding your body and your mind, and I'm just grateful to be a part of that routine. And again, that is immensely powerful, and I'm immensely grateful. And everybody, thank you for heading over to iTunes and leaving me these reviews for the show. It just really puts a big smile on my face, and hits me in my heart every time. So I appreciate it so much, please keep them coming. And on that note, let's get to our topic of the day. 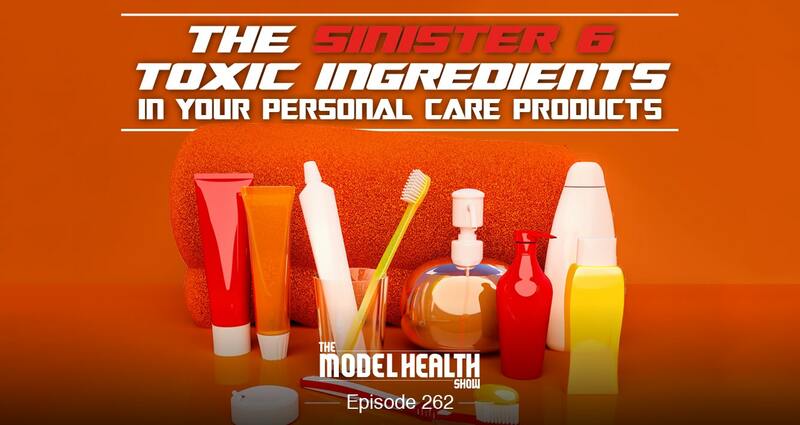 So today we're talking about the hidden dangers in our personal care products. This is information that all of us need to know about because we've moved to this chemistry over nature paradigm in human evolution, but things are changing of course, but we still need to be aware that a lot of this stuff is in our food supply and also in the supply of our personal care products. And so one of the things I want to focus on and talk about first is with what helps to generally keep us from being stink-stink. Alright? I'm talking about deodorant. Alright? Deodorant. This is an interesting invention by humans that has helped to keep people from being funky, because nobody really wants to be around that. You know? It just- it is what it is. But here's one of the big issues, is that many of the kind of conventional deodorants contain a very dangerous compound called aluminum. Alright, it's called aluminum. Why is it in there? It's because it helps to keep perspiration in. It's an antiperspirant, right? Antiperspirant. First we want to start there. Is that even a good idea? Should we stop your body from doing something that it wants to do? Alright? This process of sweating is eliminating waste, it's eliminating metabolic waste products, and we're just going to go ahead and, 'Oh I'm just going to clog that up. I'm going to plug that up. We don't need to have stuff come out of there.' Is that a good idea? Now here's one of the big issues, is that your lymph nodes specifically are right around that area of your armpit, and as we've talked about- and we did a show dedicated to the hidden secret life of your immune system. We talked a lot about the lymphatic system. This is basically your body's extracellular waste management system, alright? And there's a lot of kind of immune activity that's going on with your lymphatic cells, and if things get plugged up, this can cause a lot of catastrophic issues going on with your immune system. And one of those potentials is cancer, alright? Because your immune system is really the regulator that goes and takes out any kind of rogue cells, these macrophages and natural killer cells, and taking out those abnormal cell activities. And so here's the issue, the 'Journal of Inorganic Chemistry,' results reported here demonstrate that aluminum compounds typically found in personal care products can interfere with the function of estrogen receptors on human breast cancer cells, alright? So this can upregulate the activity, cell growth potentially, of breast cancer cells. So it's not that this is some kind of inert substance when we're talking about aluminum. And by the way, World Health Organization cited epidemiological studies of aluminum in drinking water increasing risk for Alzheimer's disease. Alright so this is the ingestion, but again if it's on your skin, it's in your body, especially where you're sweating. So there's a lot of kind of correlation here, and we need to be aware of it. You don't want to wait around until additional studies come out citing just how potentially dangerous aluminum can be in your personal care products. So I encourage you to get aluminum-free deodorant. Now that might lead you down a path of, 'I'm just going to go deodorant-free.' Maybe not so much, maybe that's not the best thing for you to do, I'm not saying to do that. And also, over the years especially since I became aware of this stuff, there's an experimentation process to find the right deodorant that doesn't have a lot of these chemicals we're going to learn about today, and that can lead you on a journey of exploration into finding what works best for you, and that's what's most important. You have to find what works for you because some stuff isn't going to work, alright? So you have to experiment, find out. There's tons of good companies. I'm going to talk about a resource to find a lot of them later on in the show, but bottom line is you do want to avoid this stuff in your life. I'm not telling you to do that. What I am saying is we need to look for natural care products, and specifically when we're talking about deodorant that doesn't have these potentially dangerous compounds in them that can be compromising your health behind the scenes. Alright? So what I also want to put as a caveat for this episode is that this is all about your overall toxicity load. It's not just this one thing over here is going to be this big problem, it's when things are bio-accumulated in your tissues. It's when your deodorant is toxic, your food is toxic, the water you're drinking. That's when we have a real big issue, but I want you to be mindful of this stuff. You don't have to go and throw your Secret out the window, however I guarantee that there are some hazardous chemicals that are in that Secret. It's this secret, right? I guarantee you there are really dangerous toxic chemicals in that stuff, and I want you to find a better option. But if not, if you're doing a lot of other stuff right, it doesn't mean that you have to try and sacrifice that and be stinky as a result, alright? I don't want you to be the smelly kid in class. It's not what this class is about. Alright so- and that's just chipping the iceberg right here, alright? So let's move on. Let's talk about another compound that's regularly found in lotions, and shampoos, and things of that nature, and it's called parabens. Alright, parabens. You might see on some higher quality products that it says 'Paraben-free,' and this one is a pretty alarming compound. Now parabens are known to be these kind of xenoestrogens. They have the ability to mimic estrogen in our body and fit into estrogen receptor sites, and turn on programs related to estrogen because of using this lotion on your skin. Like that's crazy, but again going back, hormone cream. Right? You rub it into your skin. Right? Estrogen cream, testosterone cream, whatever it might be, progesterone. It gets into your skin and into your body. Now this was in the 'Journal of Applied Toxicology' found that breast tissue extracted from subjects exposed to parabens reveals shockingly high concentrations of parabens intact in human breast tissue samples. What? Yes. It's right there in black and white, but you don't know if you don't know. You have to keep an open mind and kind of put your assumptions aside that all these products that are out there, that companies are doing the right thing, that they're looking out for your best interest. You know, that might not be the case. You know? They just find a product that does a job, but we're not looking at the long-term health ramifications, and that this stuff literally can wind up accumulating in your tissues, and leading to some big problems. So he's saying that the- again bioaccumulation, the combination of these things can start to really cause some problems. When you're combining the parabens with dilates, with aluminum, with all these different things, we start to get into a really sketchy area, and a greater potential risk of things like cancer rearing its ugly face. And so that's the skinny on parabens. You want to check your labels again, make sure that it's not containing parabens, or preferentially a lot of products again are saying 'Paraben-free.' So that's parabens. Let's move on, let's talk about another one that's in a lot of different products out there, is sodium lauryl sulfate, or SLS. And another kind of version is sodium laureth sulfate, which is SLES. And these are surfactants, alright? Surfactants, which is also known to be a surface active agent. Alright? And what it does is it basically reduces the surface tension of the product. Alright? Well they use things like this to make it have less surface tension so that you can actually spread it, and it has a kind of liquid property to it. Now here's the issue. In a report published by the 'International Journal of Toxicology,' sodium lauryl sulfate had a degenerative effect on the cell membranes because of its protein denaturing properties. That doesn't sound good. You don't want denatured proteins. Alright? You don't want a degenerative effect. We're talking about accelerated aging by using these products. And sometimes it's the fanciest pantsiest products that you can name, endorsed again by celebrities, and they have this high dollar value at luxury stores. Say there's this wonderful anti-aging cream, but it's actually accelerating your aging. Alright? It's accelerating the aging of your skin specifically. Now let's stretch this out, let's actually dive in deeper here. Your cell membrane, this is literally the brain of your cell in many ways because it's how your cells are reading its environment, alright? Your cell membranes are reading your environment and sending information to your brain throughout your entire body about what's going on. And this function in the cell membrane can lead to dysfunction in many other places in your body. It's not just your skin cells, again because this stuff is getting absorbed into your circulation. Alright, so I want you to be aware of that as well, keep an eye out for that. Well I remember growing up, we had the baby oil, right? Baby oil. Baby oil everything. Now let me tell you about this real quickly because it's important. I didn't plan on necessarily talking about this. I put a note like maybe I'll talk about this. Baby oil is a synthetic oil. I'm mad that the name 'baby' is on there, it's such a great trick. Baby oil is a synthetic oil which is a byproduct of the distillation of gasoline. Oh come on, what? Alright now you might have heard 'mildly' treated mineral oils, right? It was like, 'Well is that the kind they use for baby oil?' No, it's more refined, but please be aware we've already got this carcinogenic property- that means cancer causing, alright? So let me take this a step further. They do use different grades for cosmetics, for example, but the World Health Organization- because mineral oil is not just in baby oil. We're talking about a lot of different cosmetic products as well. The World Health Organization has found that these other grades, even higher grade forms, contain contaminants that have been linked in studies to increased risk of cancer. Right? We're going to put this on our babies? Right? Who came up with this, right? Let's not get into any kind of conspiracy theories, and weirdness about it. We know now baby oil is not for babies and it's not for you. Alright? This is dangerous. This is not okay, so what do we do? What do we move towards? Well let's look towards things that are actually natural, that are free of kind of carcinogenic properties. Wouldn't that be a good start? You know, so there's a lot of great products out there now. You know, there's shea butter- again just minimal ingredients. Maybe they're utilizing essential oils and things like that in the formula. But shea butter, there's cocoa butter, which there's- it's chocolate butter. If you get like real cocoa butter, it's chocolate butter. Alright? Smell good, does the job. Classy to ashy? No, alright ashy to classy. Now one other thing, we did an entire episode dedicated to this because it's so wonderful, so powerful, so many different uses but coconut oil on everything. Alright? Coconut oil on everything. Now listen, I'll put this in the show notes, go back and listen to that episode like yesterday. It dealt with a lot of the kind of controversy and confusion about coconut oil and potential downsides, but I go in and actually dig into the research, and affirm a lot of times when there was some bad-mouthing about the coconut oil, people weren't actually looking at the study and they were cherry picking. Like no, I actually went in and broke it down, and I also talked about I believe twenty- over twenty different uses for coconut oil. One of those is for our skin. It's natural, it's been used for a very, very long time, we're talking centuries of use, and it's naturally rich in antioxidants. It's naturally rich in compounds that are antimicrobial, antiparasitic, antiviral, alright? Without negative side effects. Alright so coconut oil on everything. Now let's shift gears here and talk about another common thing that you'll see in a lot of personal care products, and it's called fragrance. Alright? Fragrance. Like it'll say, 'It's got this, this, and fragrance.' Oh it just has a smell. Where does fragrance come from? What? Have you ever thought about that? What the heck is fragrance? What is that? Well guess what? Researchers don't know either because fragrance is classified as- and this is the Environmental Working Group. Not only do they compile studies linking fragrances to immune dysfunction, allergies, eczema, and more, but they had a sub-category that I didn't see with many other things that I researched. What? You don't know what fragrances are? Like nobody knows except the company who's slapping on the label. And a great analogy that I got from Vani Hari is that it's sort of like when you see natural flavors on a food product, right? Natural flavors. What? What is that? That's a way that companies can sneak in compounds that are not regulated, compounds that are dangerous, and just things they don't want you to know. Alright, fragrances is that for personal care products. It's this kind of umbrella label that you can sneak a lot of stuff in there on. Alright? Now I'm not telling you don't smell good. I like to smell good, alright but let's do this from natural sources. Right? Natural sources, natural products. There's wonderful essential oils from all kinds of different things. Vanilla, there's the coconut oil scent, right? The natural coconut oil scent which makes you smell like a walking talking human pina colada. And I like that, alright? That's another way that you can go about it. Alright? There are so many different things, natural kind of essence that you can get in different personal care products, and also there's- since this consciousness is happening now, shifting over into the perfume area, and things like that, you know, body sprays. But again, you want to avoid if it says 'fragrance,' come on now. Like let's just not. Let's just not. Alright so the next one that I want you to be aware of when choosing your personal care products is synthetic colors. Alright? Synthetic colors. Now look, today I brought the- this is for Show-and-Tell. Do you remember Showand-Tell in elementary school? Oh I loved it, it was like the best thing. You bring something from home that you like, and you bring it to Show-and-Tell, and you show and you tell about it, right? ThunderCat- my Lion-O, or my Mumm-Ra. I'll bring it to school, and tell people about it, and how I love the ThunderCats. You know, shout-out to ThunderCats. But Show-and-Tell is awesome. Show-and-Tell today, I brought this Listerine Fresh Burst. ADA accepted. Now if you look at the ingredients, holy guacamole. You see some alarming things, and one of them in addition to the saccharine by the way, we're not even going to get into that today, is the dyes, alright? Green #3. Yellow #2. What? Are you serious? A friend of mine, Vani Hari, did an excellent expose on chemical food dyes, these synthetic food dyes, and how they impact our health. Southampton, this is in the UK, found that synthetic colors do in fact cause significant increase in ADHD symptoms in children. It's a tragedy that we're not looking at the underlying cause of things that are hurting our children, and instead using a band-aid solution and putting them on drugs as children. We're medicating our children without looking at what are some of the underlying causes here? How can I serve this purpose of helping my child to succeed without potentially causing them greater damage especially in their long-term health? ADHD as well, and I'll put that in the show notes. We had on the incredible Dr. John Gray who is definitely one of my favorite people on the planet, and he's got a book on the subject matter, but also just in relationships to each other, and he's got the kind of seminal work 'Men Are from Mars, Women Are from Venus,' but he also talks about his battle with ADHD as well. And it's definitely one of my favorite episodes, so make sure to check that out, we'll put that in the show notes. So again, synthetic colors. Dyes, we want to be mindful of this stuff because the jury is still out on what it's doing to our bodies, and I want to especially be even more mindful for our children. Alright so again, just something to be mindful of. So let's move on, I want to talk about something that sounds messed up, alright formaldehyde. Alright? Formaldehyde. It sounds like some fire or something because it kind of is. Particularly found in hair care products, formaldehyde and formaldehyde releasing preservatives- because this is the trick that is used, that is used in many different cosmetic products to help prevent bacteria growth, right? This is why they use it, alright? It's kind of a preservative. Now this chemical was deemed as a human carcinogen by the International Agency for Research on Carcinogens. Why is this in our personal care products? And it has specifically been linked to occupational related cancers, alright? Especially folks who are maybe working in a hair salon. And Dr. Oz just did an expose on this, and how the fumes specifically, because some of these precursors, formaldehyde releasing preservatives are only active when heated, right? So that's really where the danger comes in. It might not be right there when it's just being applied, but if it's heated like somebody's doing a press-out, right? Getting their hair pressed out. And heating these compounds releases this formaldehyde into the air, again carcinogen, cancer causing agent, and folks working in that atmosphere all the time have a greater incidence of risk. Alright? So I want you to be mindful of that. So again, hair products specifically, and we look at some of these precursors. Methylene glycol, methylene oxide, formic aldehyde. These get converted into formaldehyde, alright specifically when heated. So that's why I want you to be aware of this. I want you to be mindful, I want you to start to pay more attention to the stuff that you're putting on your body or putting into your hair. But we have to make the lifestyle choices and adjustments that fit for us, that feel good, that don't create an even bigger stress by trying to omit everything. Alright? If you want to get your hair done, and it's just like you go into your place, and they use the things, so be it, it's all good. I don't want you to flip out about it. Just focus on- like let's handle stuff that we can handle. Maybe the stuff that's in your shower, up on your shelf in your shower, or the stuff that you're brushing your teeth with, those kinds of things. Let's address the places that we can easily address, and not throw the baby out the window with the bath water, right? Whoever came up with that? That's probably the worst. That's the worst saying of all time, alright? But again, what I want you to be mindful of is it's not about being perfect. It's about progress, alright? Just kind of going in the direction of utilizing products that don't have these toxic chemicals in them where it fits best. Like you know, for me, over the years and trying different products, trying to find the right stuff that jives with me, with my unique biochemistry, my constitution. You know, I might land on a deodorant that has a questionable ingredient or two from a company that's really trying to do stuff right. You know? Maybe it contains one or two things that like, 'I don't know, that's a little sketchy,' but so many other things are avoided. Then you know, if that's what suits you and you're doing a lot of other things right, so be it. Don't make a big deal out of it. Like I love the Kiss Your Face brand. Like Kiss Your Face 'Active,' right? Great for some folks, not so great for others. You know? It might even encourage le stinky, for others it can keep you nice and odor free, or a nice odor for the 24 hours or whatever the commercials say. You know? Not particularly for this brand, but like the major brands. 48 hours or 36 hours of freshness or something I saw on a commercial. Really? What are they doing? What kind of corks are they putting in your pits? Right? If you're not going to- you're going to be odor free or whatever, sweat free for 36 hours. Are you even human anymore? So what's the first step for you eliminating the toxic load from your personal care products? Number one is just kind of start where you are. If you desire to, you can go ahead and like finish up the stuff that you're using. You know, maybe if you're using Crest toothpaste for example, and I actually have my toothpaste that I've been using for years right here. Maybe you go ahead and finish that out, and then the next time you buy, you make sure that you get yourself a product that doesn't have some of those toxic chemicals in it. And the brand is called Jason, and it's got some little accents over it, so it's probably Jason, alright? And you can check this out at Thrive Market. This is one of the things that I get from Thrive Market. I love Thrive Market because number one, they're getting these products to you that come at a premium if you go to a health food store, or even kind of conventional stores now are carrying these products because people are demanding them. But they're incredibly expensive because they don't get government subsidies, right? It costs more time and energy sometimes to acquire the best ingredients to make these products. So they tend to be a little bit more expensive, but they didn't want that to be the barrier of you getting the stuff for your body, and for your family, alright? And the food that you're eating. So Thrive Market curated the very best brands and did this so they are eliminating the middle man, they're not putting it out on the store shelf where they have to pay for that space, and instead getting it to you at the wholesale price, alright? They're getting it direct to you, cutting out the middle man, saving you 25% to 50% off every product, all of it. Their food, personal care products, household products, all of it. They wanted to get rid of that argument, and so you're also going to get access, a special exclusive thing here with The Model Health Show, to 25% off your first purchase from Thrive Market. I want you to go to www.ThriveMarket.com/modelhealth. Alright? That's www.ThriveMarket.com/modelhealth. Okay? ModelHealth all one word. In addition to the 25% to 50% off you're already getting off of all their products, you get an additional 25% off, alright? You're spending $500 on clothes. $6 shipping, why are you-' but still that could be a make or break sometimes. So free shipping as well, so definitely head over, check them out. And they've also- when you go to www.ThriveMarket.com/modelhealth, you'll see a list of twenty of my favorite products. You know, some of the foods that we eat for my family, and personal care products, and all that good stuff. But they curate and find the best companies that are not using the things that we talked about today, alright? And there's more! There's more stuff. I mean this could be a four hour lecture on the different compounds that are in our personal care products, our household cleaning products as well, you know stuff we're washing our clothes with, and things of that nature. But I wanted to give you kind of the big heavy hitters, and start to point your attention towards this transformation that happens, you know? We go from like paying more attention to our food, to paying attention to our personal care products, and then maybe eventually looking at our household cleaning products, and kind of branching out our world from there and just trying incorporate things that are health affirming, and that are supportive of you being the best version of yourself, and not subtracting from you and causing health problems you know, oftentimes behind the scenes, and in our kind of blind spot, if you will. And so again, www.ThriveMarket.com/modelhealth and this episode I really want you to- again get the point this is not about being perfect. And so again, I just want to reiterate the point that this is not about perfection, this is not about trying to do everything right and eliminating all the toxic compounds in the whole world. Like we live in a different world now, and it's just about progress, it's just about awareness, and they’ve got some incredible brands out there that are doing things right. I've got Dr. Bronner's that I use, they've got the Seventh Generation, a lot of folks know about their stuff. Mrs. Meyers, the hand soaps and things like that. As I mentioned my toothpaste, Jason. People are like, 'Shawn, why are your teeth so nice?' Jason, I guess. But hey, listen the teeth- these are like bones you can see. So if you've got healthy bones, that helps, alright? That helps significantly, eating nutrition and doing things that are healthy for your bones. Alright they've got Tom's of Maine, and they've got companies like Kiss My Face who are doing a lot of things right. They've got feminine care products from Natracare, and companies of that nature. But there are so many different companies to name that are doing stuff right, and more are emerging. So again, this could be a whole hour show just talking about the different options that there are, but I just want you to be aware of a few. And again, Thrive Market carries a bunch of them, and they curate for the best of the best. So in closing, I want this to be a bridge for you, alright? A bridge to a better way of living. Becoming more aware of the kind of situation that we're dealing with right now, and having a transition point, a bridge over into a lifestyle- an overall lifestyle that leads to more health and happiness. And this is so important for us, and it's also very, very important for our babies, alright? For the kids in our lives to be mindful of this stuff because their little bodies don't handle this stuff as well. You know, as we get older we get a little weathered, alright? Our bodies are better able to handle some of the toxic load, but babies' bodies and our little kids, we need to be mindful and start to get better products for them too when it comes to personal care and the things that we're using for their toothpaste, and things of that nature. Alright it's so important and I just wanted to communicate this with you and put together some information for you to become more educated, and also to help you to find a way to make some better choices. So I appreciate you so very much. Please understand, we've got some incredible episodes and guests coming up on the show very soon, so make sure to stay tuned. Why do they have to do these things. Products are supposed to get tested before they hit the market. I’m starting a natural skin care business and I’ve been told that it all needs testing before I can sell. and its expensive. It’s funny that. I use coconut oil as mouthwash. I use it with peppermint or tea tree for my hair, with Shea butter for my skin and with epsom salt to wash my face. Epsom salt and baking soda and coconut oil for my antipersperant.